Creating an expense policy can be a time-consuming process; but when you consider that almost 20 percent of T&E expenses fall outside of policy, it makes sense to invest the time and effort. To get you started, this document provides some helpful tips that covers ways in which you can reduce the cost of processing expenses, make it less cumbersome, and ensure compliance. 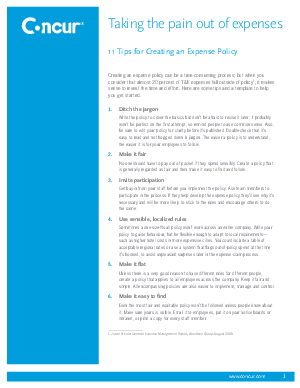 Also included is an example expense policy template with guidelines to help you create your own.